Understanding speaker design is an art. Usually, consumers would go to audio stores and pick out either the most expensive or the cheapest speakers set they can get their hands on without factoring in the qualities that make up a good speaker. A term you would often come across when buying (or building) speaker sets is the difference between a 2-way and 3-way speaker design. When it comes to audio speaker quality, there are different types of speakers, and there are different types of speaker systems that utilize them. This is the reason why some speakers produce low-thumping bass sounds while other capture the high-end frequencies more. Understanding the types of speakers and the science behind the 2-way and 3-way designs can help you get your money’s worth, regardless of the brand. In order to understand speaker design, you must first learn the types of speakers and their role in the 2-way and 3-way setup. Speakers come in different shapes and sizes. A fundamental thing to remember with speaker design is that the bigger the cone (speaker), the heavier the tone, and vice versa. Woofer is a speaker that focuses on the low-end frequencies of the sound spectrum. Ideally, a Woofer covers frequencies between 20 to 2,000 Hz. Woofer speakers utilize the sound derived from bass dominant music such as R&B, Trap Music, Rap, Disco, Funk, Dubstep. DJs also prefer using Woofer speakers to induce the thumping effects of the music they produce. Subwoofers – Produce sound between 20 to 200 Hz. Focuses on small audio range, and consists of multiple drivers in a speaker enclosure. Midwoofers – Produce sound between 200 to 5,000 Hz. Midwoofers can slightly achieve higher frequencies from the standard Woofer. Rotary Woofers – Produce sound lower than 20 Hz. This type of Woofer is not commonly used because it uses fan blades and air pressure to work instead of t​​he standard cone and coil set-up. No, we are not talking about the users of the social media app. Tweeters are speakers that operate on the high-end frequencies of sound. Tweeters are somewhat the sparkle to the speaker. Ideally, a standard tweeter covers a sound frequency from around 2,000 to 20,000 Hz. Tweeters are usually designed as small and light due to its characteristic of dispersing sound and stereo separation. This effectively captures the high tones of string and wind instruments perfectly. The highest frequency achieved by a violin is 16,000Hz, which is well within the Tweeter’s range. Cone Tweeters – Also known as “whizzer cones”. It is the cheapest and the most common tweeter produced by car manufacturers. Cone tweeters are infamous for its quality in spreading the sound as wide as other designs. Dome Tweeters – Are the more well-known tweeters for its ability to disperse sound more effectively which include a smooth response to high-end frequencies. Almost all home speaker systems utilize the dome tweeters for its tremendous surround sound ability, thanks to its fabric or silk-like design. Sub-Dome Tweeters - Contrary to popular belief, the Dome Tweeter actually came from the Sub-Dome and not the other way around. Sub-Dome tweeters are the middle ground between the cone and the dome tweeter, meaning it is a cone tweeter built inside a dome. This speaker covers a range of 20Hz to 20,000Hz which consequentially compromises the high and low-frequency qualities of the sound. The Bluetooth speaker is a perfect example of a full range speaker. Now that you have a basic knowledge of speaker types let us look at how these are utilized in terms of design. Speaker engineers and sound enthusiasts have tried different methods in crossing over these different speaker types to achieve the perfect sound output. The 2-way and 3-way design is the common ground of all speaker designs. The difference between them is that the 2-way design has two distinct drivers (usually a Woofer and Tweeter), while the 3-way has the inclusion of a Mid-Driver ​ which produces sound between 200 to 5,000 Hz. The Mid-driver acts as a bridge between the high and low frequencies produced by the Woofer and Tweeter. An important term to know with these designs is the concept of Crossovers. This is the audible frequency range with respect to the output. Remember the ranges covered by the Woofer and Tweeter in terms of Hz? Well, the overlapping frequencies between them are called crossovers. 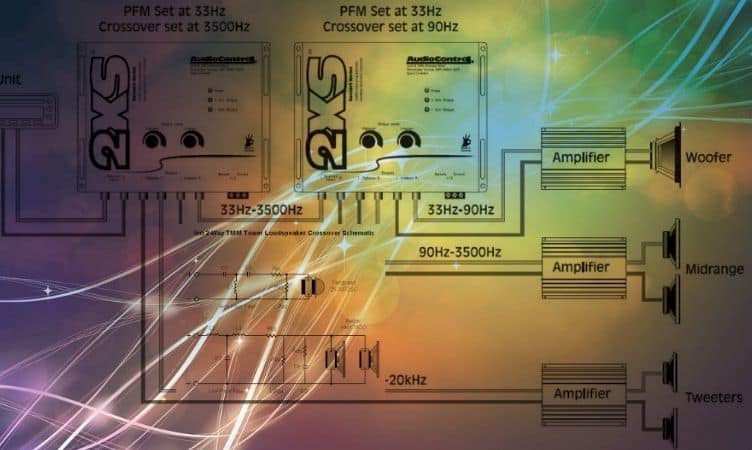 Crossovers help distinguish the high and low frequencies of sound. Think of it like a band performance, if the guitars, or the bass, or the drums are too loud, you cannot appreciate the music. Crossovers are the middle ground for you to hear the whole band or for this case, the audio perfectly well through the speakers. Ideally, people would think that because a 3-way has more drivers it has a better crossover than a 2-way speaker. It makes sense, because three frequencies chopped up are better than two. For a 2-way speaker, one of the drivers must either be pre-dominantly a Woofer or Tweeter. But again, it all boils down to how the crossovers are positioned. There are many ways to check how the speaker design is optimized and how a good set up determines the best quality of speaker output. Remember, the basic need for a speaker to work well is capturing the overlapping frequencies of the tweeter and woofer. Sound experts would profess that for a home studio or a recording set-up a 3-way is better because it captures more sound, while car experts would suggest that 2-way coaxial set-ups are better because it optimizes the soundboard of the car. Choosing between a 3- way and a 2-way speaker will depend greatly on your intended use. Anything that covers the widest range of frequencies will reproduce a fuller sound. But in situations wherein you’ll be limited by space or cost, a 2-way may be your best bet.